The 2014, Ram 1500 is the first half-ton pickup to offer a modern, clean diesel engine as an option (a light-duty diesel was offered by Dodge previously), and it has Ram marketeers relentlessly chanting the mantra, “28 miles per gallon” with religious fervor. Both the 3.6-liter V6 and 5.7-liter V8 gasoline powerplants carry over to 2014 unchanged from the 2013 model year, and they are paired with either a 6- or 8-speed automatic. While both Ford and GM offer a bigger, more powerful V8 than Ram’s workhorse Hemi, only Ram puts the big engine in a regular cab pickup. 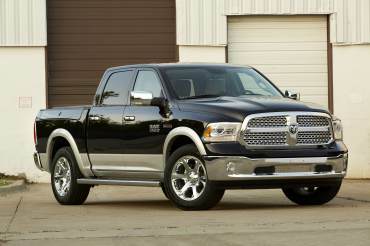 Other than new colors and chrome, the current generation Ram 1500 is basically unchanged. The Ram 1500 is considered a half-ton pickup capable of cargo capacity and trailer tow ratings similar to what its competition — Ford F-150, Chevy Silverado/GMC Sierra, Nissan Titan and Toyota Tundra all offer. Personally, I don’t consider the Honda Ridgeline to be a bona fide pickup on a par with the others because it doesn’t have a separate frame, cab or bed, nor a choice of two or four-wheel drive. Brand loyalty in pickup trucks borders on being a blood sport, but the truth is, there are no bad full-size pickups. 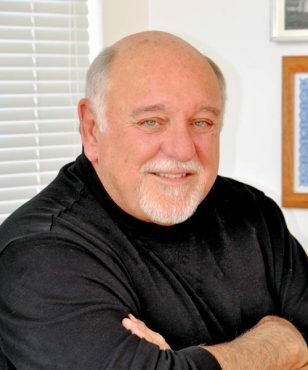 However, the 2014 Ram 1500 offers three different cabs, engines, and bed lengths (two with RamBox), as well as two transmissions, two suspension systems, and interiors ranging from hose-out to luxurious, When tabulated by cab, bed, driveline and trim level, there are more than 70 different ways to configure a Ram 1500 – with prices ranging from about $23,000 to over $57,000. While general in nature, this review will focus primarily on the Eco-diesel powertrain version of the Ram 1500. Model Lineup: As stated, there are over 70 different configuration possibilities. The 2014 Ram comes in Tradesman, Express, HFE, Big Horn, Lone Star, Sport, Outdoorsman, Laramie, Laramie Longhorn and Laramie Limited trim levels. Some, such as Big Horn and Lone Star, are primarily cosmetic packaging only available in specific regions. Ram Tradesman, Sport, Outdoorsman, Big Horn and Lone Star are available in all body styles, while all others are restricted to certain cabs. In short, cab choices include a Regular Cab with short (6.3 feet) or long (8 feet) bed, four-door Quad Cab with short bed (6.3 feet), and the Crew Cab with a short bed (5.6 feet) or long bed (6.3 feet). Making this more confusing is the fact Ram terminology overlaps — some “long” and “short” beds are the same length, depending on the cab. Walkaround: Originators of the big, aggressive semi-inspired grill that adorns most pickups now except the Titan, the Ram’s signature intimidating styling has evolved more than changed over time. The front grille is now tilted forward, and is surprisingly aerodynamic with a low drag co-efficient. 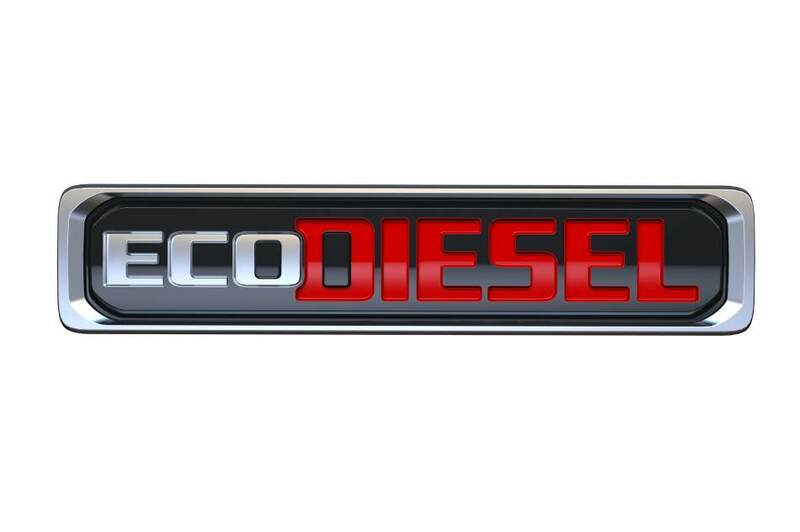 Both the diesel and HFE model use grille shutters to automatically adjust the amount of air going through the coolers. Grilles vary from simple dark colors on base models, to the horizontal themed Sport, to chrome mesh on top-of-the-line trucks. Bumpers were reshaped in 2013 to be substantial yet cheat the wind, along with rounding the windshield somewhat. The sides are fairly flat, although some side mirrors stand off from the door glass. In the rear, the tailgate spoiler was rounded for improved aerodynamics, while the tires are almost flush with the body panels. The large rear bumper has half-round openings for the sport exhaust on trucks so equipped. Both seven and four-pin trailer plugs are mounted adjacent to the license plate. The tailgate has a lock that works with the central locking system, and a torsion bar system cuts apparent tailgate weight in half for ease of lowering and raising. The RamBox Cargo Management System is a pickup box with a rectangular interior and no wheel-well intrusions, it can accommodate a 4×8 sheet of building material flat on the floor. In the tops of both sides are two locking bins. The RamBox has some trade-offs. It reduces total cargo box capacity, adds weight that comes off payload, and because the cargo box lids open upward, it’s not compatible with camper shells, cargo caps, some bed covers and many racks. Side rails with cleats secure cargo, and a bed divider that locks into place segments the bed into smaller areas or can be flipped over and used as a bed extender with the tailgate down. 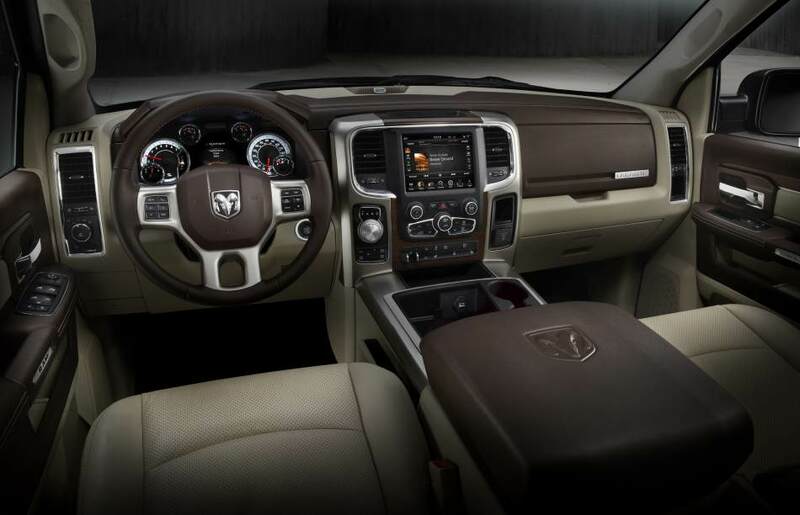 Interior: Our test model was a Big Horn Crew Cab offering seating for five. It featured premium cloth bucket seats, in front, with a power 10-way driver seat, a 60/40 split folding seat in back, plus second row in-floor storage bins. The leather wrapped wheel was home to audio controls for the AM/FM/CD, which was controlled via Chrysler’s Uconnect system from a programmable 7-inch touch screen, which did double duty for the backup camera, and climate controls. Bluetooth was standard, as were two 12-volt power ports and a 115-volt power outlet. Instrumentation includes a tach, with myriad other data (transmission fluid temperature, etc) in the display between the primary gauges. One major improvement is the increased size of the knobs used for manual controls — the baby-sized ones used for so long are history. Under The Hood: Our test model featured the new 3.0-liter V6 diesel. It’s rated at 240 horses and married to Chrysler’s 8-speed TorqueFlite automatic transmission. It delivers 420 pound-feet of torque, with an EPA-estimated 20/28 mpg City/Highway. Behind The Wheel: We’ve had two short opportunities to drive this truck, and was impressed both times. The ride is smooth and quieter than expected. The new 3-liter V6 turbodiesel — shared with the Jeep Grand Cherokee — is rated at 240 horses at a relaxed 3600 rpm, and 420 pound-feet of torque at 2000 rpm. Idle is slightly noisier than the gas engines but at maximum power seems quieter because peak output happens at half the revs of gas engines. 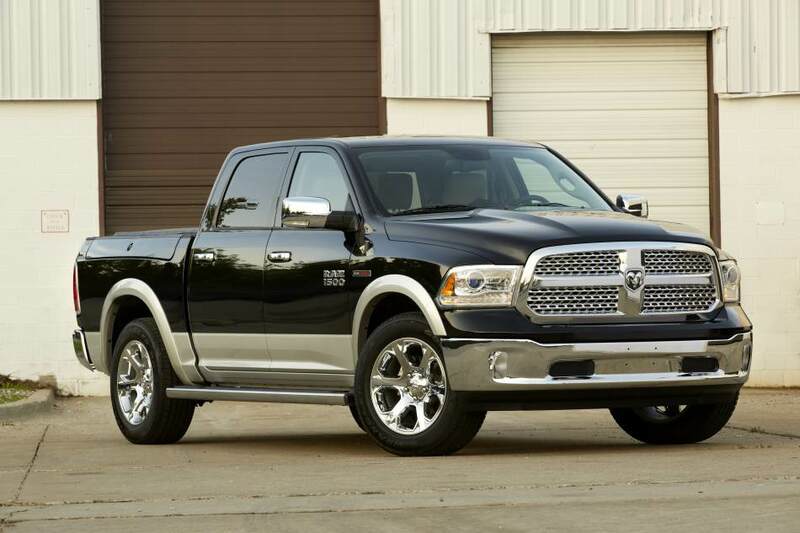 Top tow rating is 9200 pounds, and it should be a much more efficient tow vehicle than a Hemi powered Ram. Whines: The rearview camera image is not as good as some on other brands. The image is grainy and jumps, sort of like using a satellite phone to talk to someone on the other side of the planet. Some of the specialty model badging is a little gaudy for my taste. 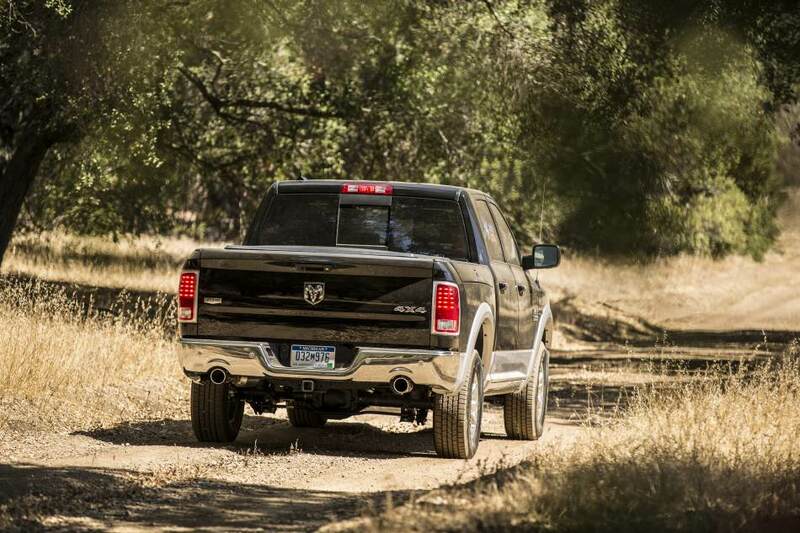 Bottom Line: The Ram 1500 combines the new Ecodiesel V6 with a refined cabin and driving experience. At the heralded 28 mpg, it should be a winner, and if successful, will open the door for competing diesels in the near future.